Not since four mop-topped rockers crashed the American coast with helter-skelter songs about walruses and revolution have the Brits exported anything as brashly enjoyable as BULLDOG Gin. Here are four damn good reasons to drop what you're drinking and reach for the good stuff: • Their 12 all-natural botanicals from nine different countries scoff at the ordinary with the likes of White Poppy, organically farmed Juniper from Tuscany, Lotus Leaves, and Dragon Eye -- a cousin of the lychee, and also a movie where an Irish-English spy must steal the eyeball of a giant lizard played by a former English spy who is actually Scottish. • It uses the purest British grain and water, and is quadruple distilled and hand-crafted at a 250-year old English distillery in traditional copper pots for extreme smoothness. Its balanced flavour profile also allows you to taste the range of botanicals, similar to tasting the rainbow, except there is no cherry tropicola in BULLDOG Gin. • It's well-mannered enough to drink neat, but is also more mixable than your grandfather's gin -- so much so that it will convert the most ardent vodka drinker with one revelatory sip. See the online cocktail list for creations from the classic Gimlet, to the plum wine & lavender soda Plumdog Martini, to the Gin Surfer, a shot as thrilling as it is smooth, even though technically there are no sharks involved. 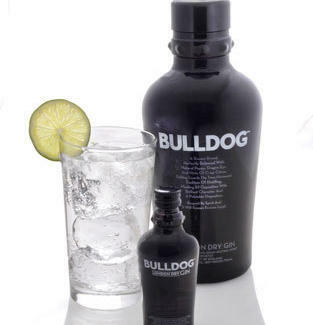 • If its impressive grip of awards isn't endorsement enough to try BULLDOG, check out the cool dark bottle with broad shoulders and an iconic spiked collar -- a nod to the gin's namesake, Winston "The British Bulldog" Churchill, who like a bulldog might have been rotund, but would never surrender. Take BULLDOG by the scruff at Fresh Direct (it's the only imported gin they offer), or on special at Astor Wine & Spirits for $21.99 -- considering the super-premium nature of the product, you'll be able to enjoy it eight days a week, even if you live in an oddly coloured submarine. Want to know how to mix a London Mule? Find out right here, then reward BULLDOG for its good behaviour by liking it on Facebook.